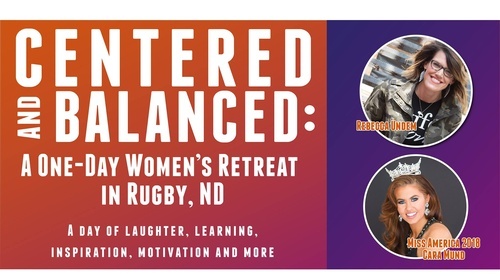 Centered and Balanced: A One-Day Women’s Retreat in Rugby will be held Tuesday, April 30 Downtown Rugby (Previous Ellie Ann's Building - 136 S Main Ave, Rugby). 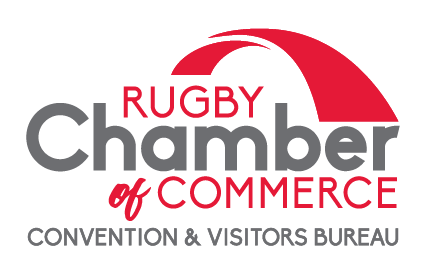 Registration begins at 10a.m., with preregistration & yoga at 9a.m. The retreat will feature speaker and author Rebecca Undem and Miss America 2018 Cara Mund. The cost is $100 and includes guest speakers along with Rebecca Undem’s book, workshops, morning yoga, lunch & supper, snacks, prizes and other special goodies. The retreat is open to women of all ages. Tickets may be purchased online at Eventbrite.com or by calling Ashley for more information at 701-412-1033. Follow facebook page for more information and prizes. $100, this includes guest speakers along with Rebecca Undem's book, workshops, morning yoga, lunch & supper, snacks, prizes and other special goodies.